Metropolitan Hilarion of Volokolamsk, head of the Moscow Patriarchate Department for External Church Relation, speaks about the visit of His Holiness Patriarch Kirill of Moscow and All Russia to China in his interview to Olga Samsonova, RIA Novosti news agency. – Your Eminence, what is the status of the Orthodox Church in China? Is it recognized by the state? – The Chinese Autonomous Orthodox Church was founded in 1956. At that time the situation in the country was already quite complicated and the Chinese Church did not manage to obtain registration as a religious association. However, later, in the years of ‘the Cultural Revolution’, almost all of its structure was destroyed; many churches were demolished; the clergy were deprived of the opportunity to celebrate. It was only in the 80s that the religious policy of the state changed. It was permitted, for instance, to resume divine services in the church of the protecting Veil in Harbin, where Father Gregory Ju had served until his death in 2000. But after his death there were no priests in the church and the services actually stopped. Though the church officially is considered acting, actually divine services are not celebrated in it. – What is the purpose of your negotiations with the Chinese side? – We set as the goal of our negotiation with the Chinese State Administration for Religious Affairs to normalise the status of the Chinese Autonomous Orthodox Church precisely as the National Orthodox Church of China. It means that eventually she should be registered as a religious association. It should have its own bishop, its own clergy and acting churches. The appointment of a bishop, however, is the ultimate rather than an intermediate goal, and the aims we would like to achieve in the coming years are, in the first place, the appointment of Chinese priests to acting parishes, such as the church of the protecting Veil in Harbin. It is with this aim that we have signed two memorandums with the State Administration for Religious Affairs. One of them concerns the training of Chinese students in the theological schools of the Russian Church, and now two students are already trained. We hope that soon they will be able to get ordained as priests and serve in the acting churches in the PRC. The visit of His Holiness Patriarch Kirill is a project we have been in preparation for a long time in dialogue with the State Administration for Religious Affairs, and we are glad this preparatory work has been a success and that the visit takes place on a very high level, I would say, as high as possible. The Patriarch met with the state leaders of the PRC. It is an unprecedented event of a special kind and special significance. There has been no such thing in the history of the Russian church or the history of the People’s Republic of China because after 1949 the state leader of China has never met with the leader of any Christian Church. We hope this event will open up new opportunities for our dialogue and cooperation on religious issues. Just as other events of this visit, first of all divine services, of course, the Patriarch will celebrate, it will help to achieve an early normalization of the status of the Chinese Orthodox Church and Chinese Orthodox faithful. 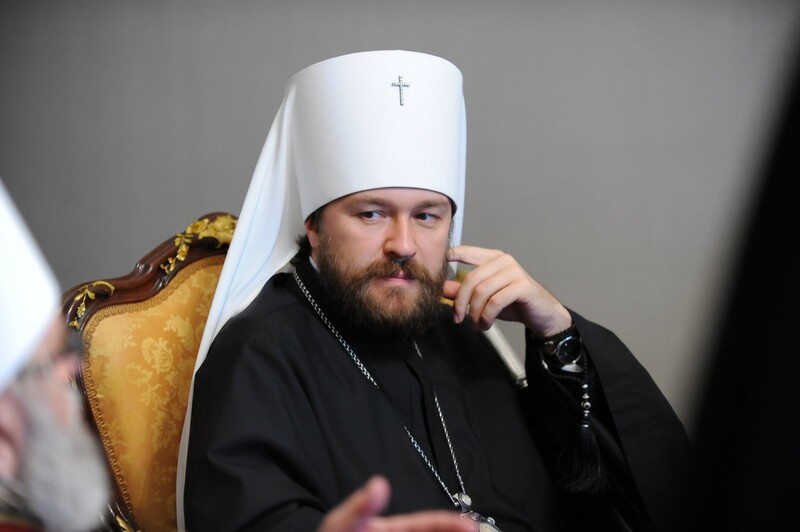 – The Russian Orthodox Church has been in dialogue with the PRC authorities throughout the recent years, and you have visited China on many occasions as head of the Moscow Patriarchate Department for External Church Relations. Can you assess the dynamic of changes taking place in the attitude of the Chinese side to this dialogue and visits by the Russian Church’s representatives to the PRC? – The dynamic of our relations is absolutely positive. It has been such since 1993 when Metropolitan Kirill, now His Holiness the Patriarch, visited the country. It was then that the foundation was laid down for the relations to become now quite official and formalized. But we should also understand the specificity of China as a country with millennia-long history, a state for which twenty years is quite a short period of time. I think we should not expect any astronomic speed in our progress to the set goals. It will be an onward movement and these goals will be achieved step by step. It is very important that any decision made should be a joint one, ours and that of the PRC state leaders, so that this process of normalization of the status of the Orthodox Church in China may go with full respect for the Constitution and laws of the People’s Republic of China. – Does the way in which the PRC authorities understand the problems of the Church in China coincide with the vision of the Russian Orthodox Church? At least the negotiation we have conducted in recent years have shown a very high degree of mutual understanding, but at the same time a certain degree of caution on the part of our Chinese partners, which is dictated, as we see it, by the wish to observe all the laws and norms existing in China and to conduct the dialogue progressively. As we are often told by our Chinese partners in dialogue, we should not forestall events and every event should take place at a moment when the conditions are ripe. We believe the conditions for Chinese priests to appear in Chinese Orthodox Churches have already ripened, and this is the immediate goal we seek to achieve at this stage.